The largest collection of L.S. Lowry signed limited edition prints in the UK! A small selection of work in the studio. Originals, lithographs and limited editions prints for sale. Signed, limited editions prints from £850; (unsigned) limited edition prints from £98. 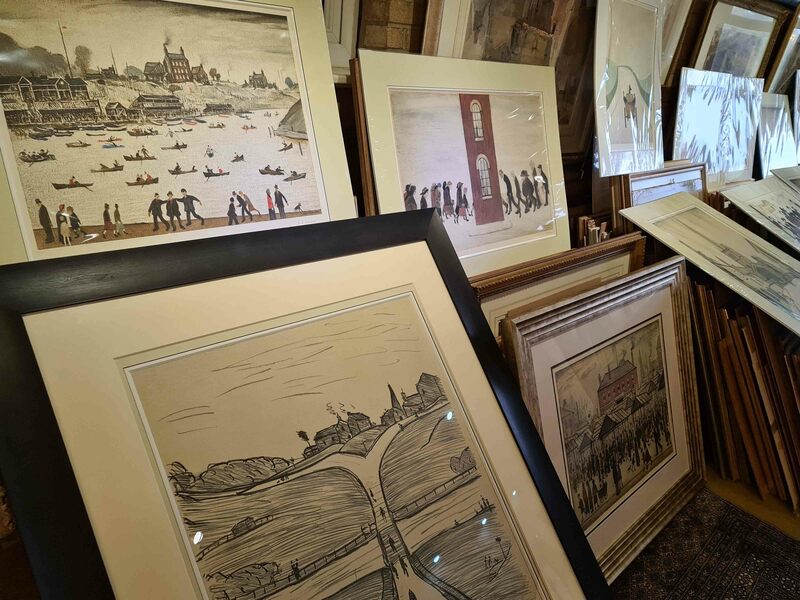 There are approximately 54 signed prints (signed, limited edition print titles) by L.S.Lowry and 17 lithographic prints. Approximately 26 unsigned, limited edition lslowry prints. Numerous Lowry open edition, poster prints of decorative value only were published. The signed L.S.Lowry prints usually have an embossed stamp, by the Fine art trade guild, or that of the publisher. Some print titles are simply signed and numbered. Several print titles eg. 'Mill scene' print, 'Level crossing' print, and 'Market scene' print are simply signed in pencil by Lowry. EMAIL:-Click Here to enquire for Lowry print prices. self-taught and untutored. Lowry commented, "Started at fifteen years old. Don't know why". LSLowry began evening classes in antique art and free handart drawing during 1905. Lowry's family moved to Station Road, Pendlebury. after years, became pretty interested in it, eventually obsessed by it". Lowry saw the subjects for his paintings all around him. In Lowry's later life, L.S.L. recalled a particular event. the station, saw the Acme Spinning Company's mill. The huge black framework of rows of yellow lit windows standing up against the sad, damp charged afternoon sky. The mill was turning out. "Gazing at this scene, which I'd looked at many times without seeing, with rapture." A writer in The Guardian newspaper, Bernard Taylor, recognised the unique quality of Lowry's art work, when he reviewed an early exhibition. Lancashire street scenes, interpreted with technical means as yet imperfect, but with real imagination. We hear a great deal nowadays about recovering the simplicity of vision of primitives in art. These pictures are authentically primitive, the real thing not an artificially cultivated likeness to it. determination to express what the artist has felt. Whether the result is according to rule or not..."
Just when this northern artist began to have success, he was moving away from the subjects that everybody wanted him to produce. Lowry also became preoccupied about whether his art would last. "I painted from childhood to childhood". Lowry became an old man - often protesting to interviewers that he had "given up, packed it in". Celebrating his art and transforming the cityscape again.